We all have dreams for remodeling our homes. Whether it’s just repurposing a room, taking advantage of otherwise wasted space, or starting from scratch and redoing an entire floor, the possibilities of remodeling are endless. Which is perfect when you have something very specific in mind, like in the case of these four "dream room" projects. What seamstress wouldn't want a sewing room to spread out and sew to her heart's content? For this homeowner in Indian Hill, the only problem was finding the right space. With no basement or spare rooms in the house, Neal's was tapped to convert a portion of the garage for the renovation. 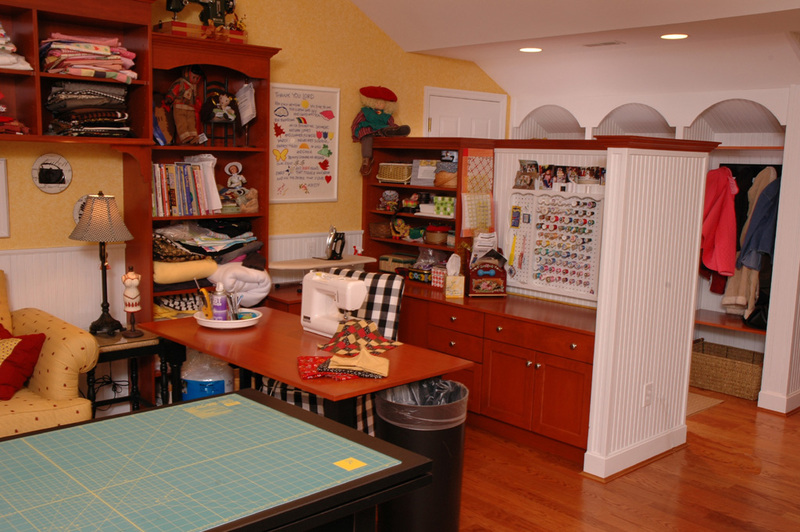 This open sewing room was achieved by converting a bay of the existing garage into a new living space. In order to create the perfect space, the original garage door was removed and replaced with a large window and french doors. Skylights were added to the existing vaulted ceiling, bringing in even more natural lighting to brighten up the workspace. Custom cherry cabinets provide plenty of handy storage, and wood floors give the room a comfortable, homey feeling in keeping with the homeowner's personality. 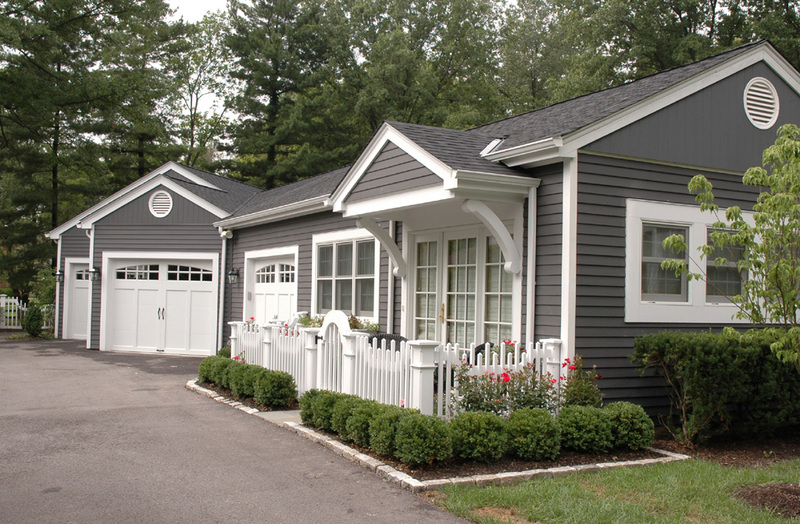 as a distictive cottage-style addition to their property. Since this area also served the family entrance to the house, a few additional considerations were included in the room to allow for multi purpose use without intruding on the sewing space. A dividing wall was added to keep foot traffic through the area to a minimum. The new hallway created by that acts as a mudroom, featuring cubbies for coats, shoes and bookbags. Nearby, also out of the way of the work table, a portion of the room was also devoted to the family pets, including a sink and built-in feeding stations. A dividing halfwall provides more storage space for the sewing room as well as a mudroom hallway between the adjacent garage and the main house. Check out more photos from this entire project. After moving to the U.S. from England, this homeowner was anxious to have a space that felt like home. 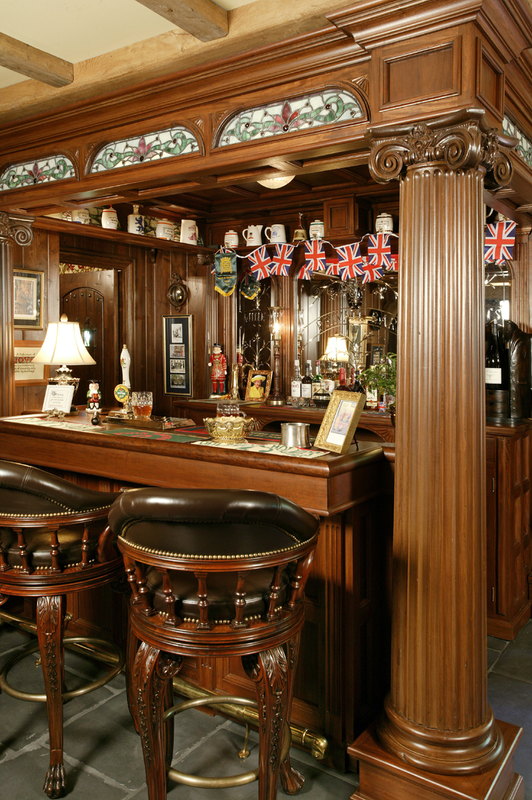 He asked us to convert the unfinished basement of his Anderson Township home into an authentic English-style pub. And he meant authentic. 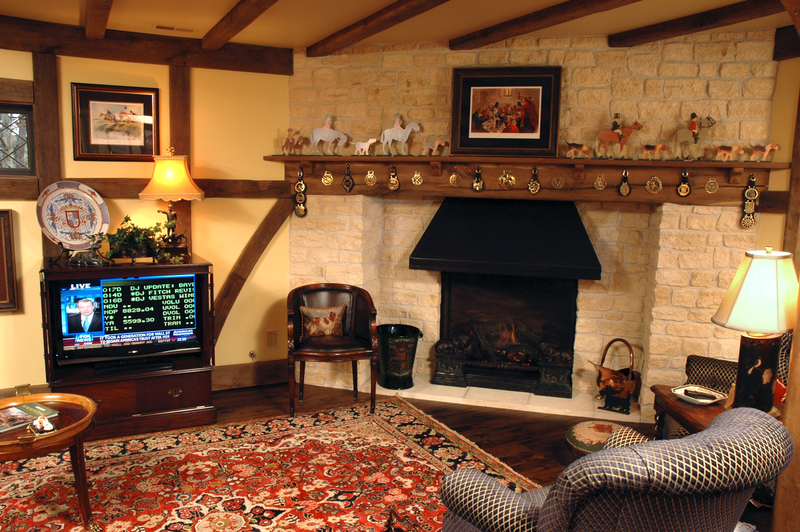 A cozy and rustic fireplace highlights the corner of a Tudor-style den, and provides a space to show one of the homeowner's many collections. Serving as a tribute and reminder of his homeland right here in Ohio, the lower level remodel was given all the amenities of a full service pub, down the to smallest detail. The center piece of the remodel is the incorporation of an antique English bar the homeowner had shipped across the pond. bar for the quality of the rest of the space. With the use of multiple sitting nooks, and unexpected details throughout, the basement was transformed into space that could just as easily handle a large party as it could be a place to drink a cup of tea alone. The use of supplies sourced from Great Britain and a selection of period-inspired furniture gave the room even more authenticity. One area includes a spectacular wine cellar that starts a conversation of its own. 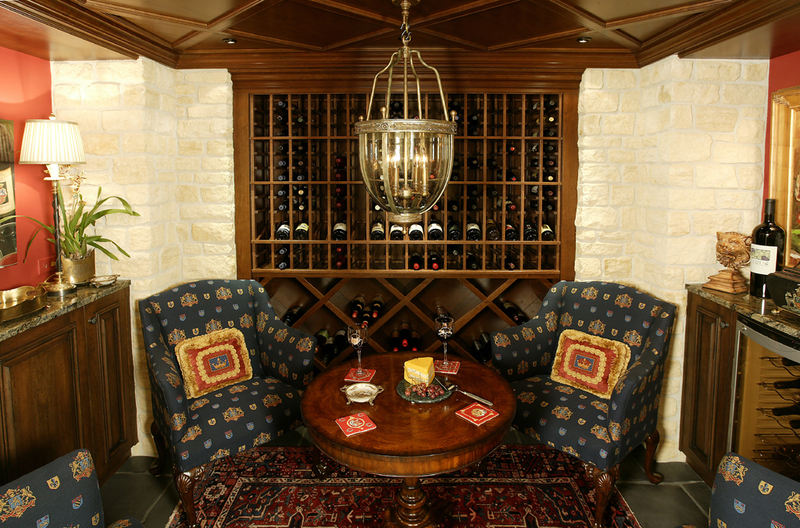 This wine cellar acts as a tasting room for guests that feels private but still inviting. The beauty of this space is truly in the details, and there are many. From floor to ceiling, there are custom beams, paneling, wood archways, half walls, plate rails, and a huge amount of English antiques and collectables. Archways and rounded doors lead you from one space to another in a maze-like collection of vignettes. All these pieces came together from England to create the most genuine pub experience to be had this side of the pond. This Indian Hill family wanted to turn their backyard into a retreat with a new lagoon-style pool and hot tub that complimented the sloped yard. 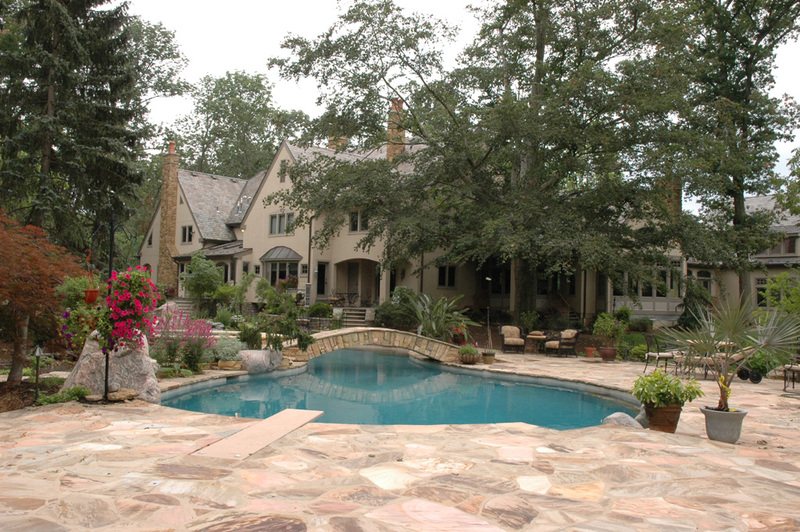 With the use of stone and smart design, Neal's was able to turn this yard into a dream oasis. Because it was important to the homeowners that the hardscape worked in harmony with the existing plant life around the pool area, a Rich Tennessee Quartzite served as a beautiful and functional foundation for the patio and pool entrance. The owners also asked for an integrated diving board to be installed right next to a large boulder that was skillfully chiseled to sit partially in the pool. a natural feeling to the pool. The areas beyond the pool, including the hot tub, are accessible either by a meandering path round either side of the pool through new garden spaces, or by taking the shortcut- an arched stone bridge that marks the transition from shallow end to deep end. The hot tub has a waterfall feature that flows straight into the main pool. 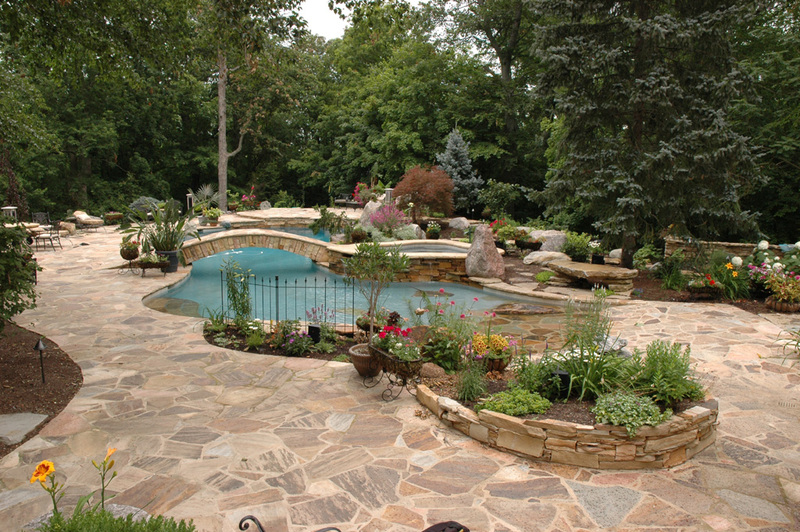 The colors of the stone and added landscaping around the pool work in harmony and provides a beautiful view from all angles. This homeowner always dreamed of retreating to the comforts of a barn style cabin, but thought he was unable to do that in his suburban, Villa Hills, KY, home. Neal's was able to bring his dream to life by transforming an underused space in the home's lower level. To create the rustic design in this home remodel, the use of wood was crucial. 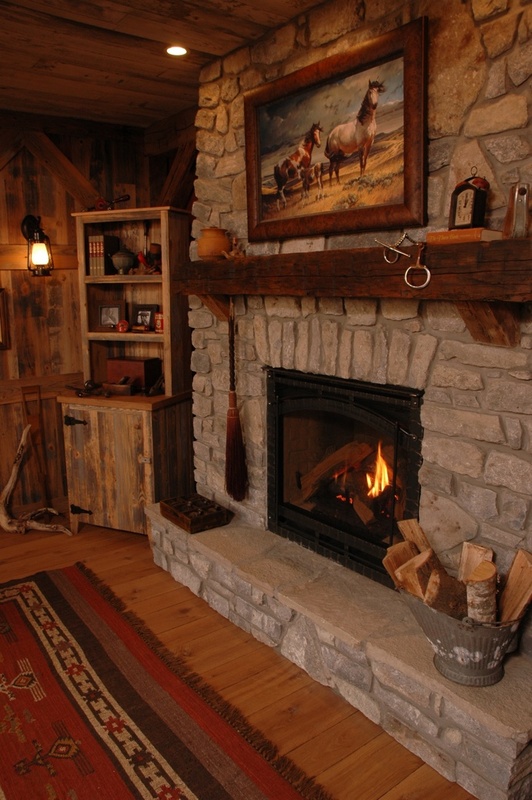 Providing the most authentic feel is the selection of varied reclaimed and distressed lumber. Large beams throughout the room create the framework of a pole barn. Even the custom furniture and wet bar was made from the extra reclaimed wood used on the walls, ceiling and floor. additional boards to help the stone fireplace stand out among the wood. The same wood used for the walls was also used to cover the room’s french doors. Strap style iron hinges were placed on the doors to further add to the transformation. 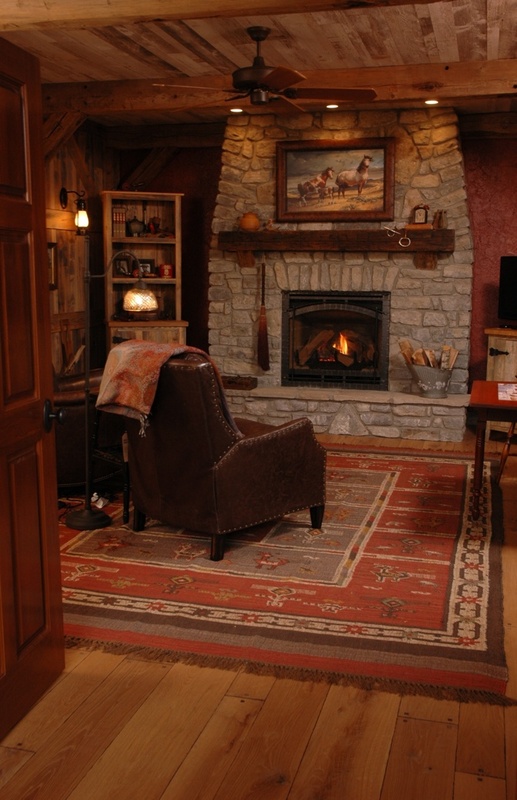 A beautiful direct vent fireplace, surrounded by authentic creek rock and adorned with a gorgeous reclaimed beam mantle, brings light and warmth into the barn-inspired room. look to the stand-out piece. 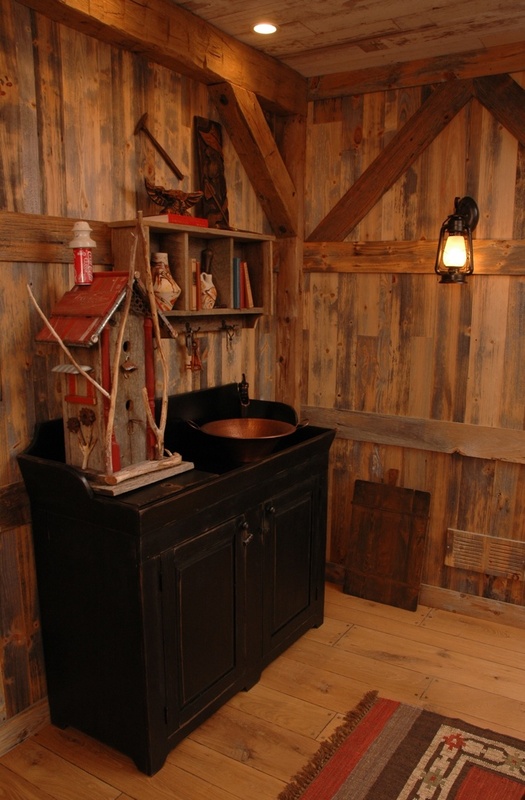 Other small features tied the room together, such as the use of rail road spikes in the ceiling beams, floorboards that vary in size, and handmade lanterns that hang throughout the room to create another source of light. Even the non-traditional wet bar continued the theme with the use of a copper vessel sink and a water-pump style faucet. antique look, but holds the modern convenience of a microwave.